magickally crafted with positive intent, and in harmony with the earth, moon and sun's cycles. We are in the Santa Cruz Mountains of the San Lorenzo Valley among the redwoods in historic Boulder Creek, California. Come see us when you visit Santa Cruz and on your way to visit Big Basin Redwoods State Park or Henry Cowell Redwoods State Park. 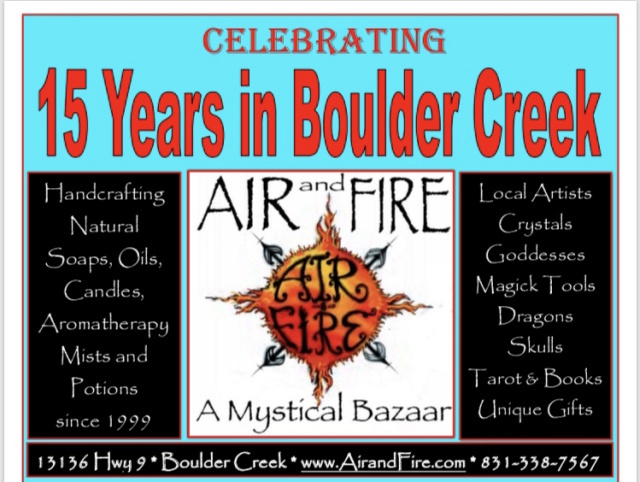 Air and Fire is a Mystical Bazaar full of magickal creatures. It is inhabited by a wonderful variety of Gods, Goddesses, fairies, dragons, gargoyles, mermaids, angels and more. An abundance of crystals and stones with metaphysical and healing properties line the shelves in a rainbow of colors. We are the pagan occult shop in the area, carrying ritual tools, books, tarot, runes and supplies. Our knowledgeable staff is here to assist. We have a public altar for your use and offer tarot readings, energy work, hypnotherapy & nutrition consultation by appointment. You'll find plenty of tools and accoutrements for the Goddess in your life! We are delighted to feature the beautiful artwork of over 50 talented local Artists! Local arts range from natural incense, jewelry, books, music and prints to one of a kind wood carvings and original paintings. Find that unique gift for that special someone in your life, young, old and young at heart you will not be dissappointed. The shop carries an eclectic selection of books and statues of Gods and Goddesses from around the world. Come and see... Blessed Be!